Dining at Angeli's Italian, our favorite neighborhood trattoria, L and I took this Napa Cab BYOB. Regretably, Angeli's upped their corkage fee to $20, a bit excessive for the suburbs. At that price, city venues offer premium wine services with knowledgeable trained wine staff, premium wine glasses, decanting, a wholly different wine experience. Sadly, as a result, we dine their less often and opt for seeking new adventurous venues. 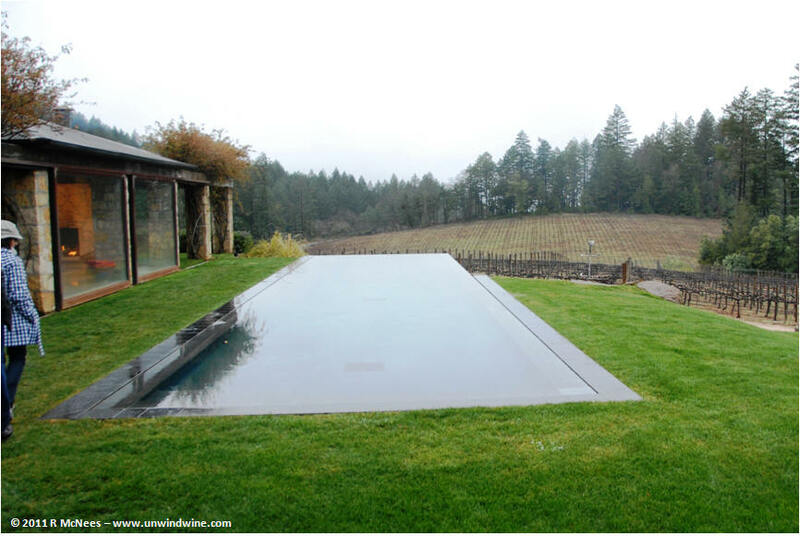 Our visit to the Constant Diamond Mountain vineyard estate high atop Diamond Mountain was a highlight of our Diamond Mountain Napa Valley Wine Experience back in 2011. The spectacular setting at the northern end of the Mayacamas Range above the town of Calistoga overlooks Napa Valley to the east and Sonoma Valley to the west. It is the said to be highest elevation vineyard in the area and is one of but a few properties that span both sides of the boundary line at the summit that separates the two Counties and geographic regions. The historic property is among the oldest wineries in the valley with history dating back to the late 1800's. 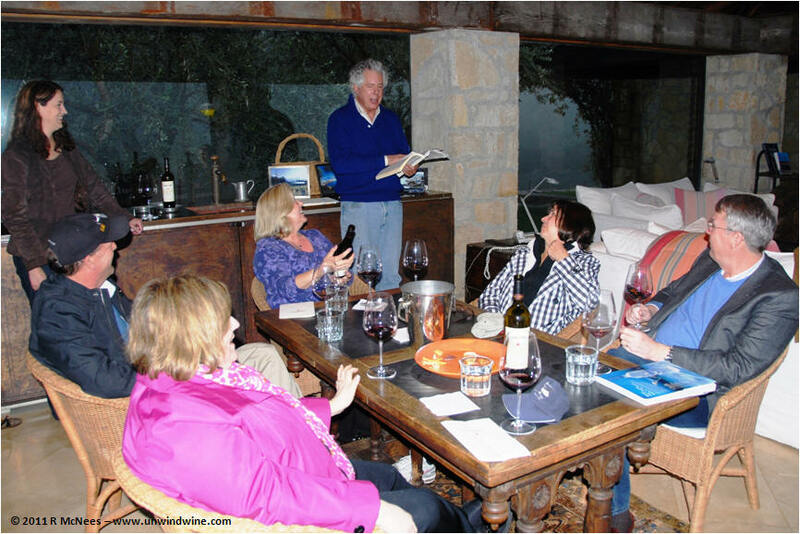 Freddie Constant hosting our wine tasting at the estate. The late Freddie Constant and wife Mary, and consulting winemaker Paul Hobbs produced Bordeaux style red blend wines. Sadly, colorful Freddie passed away since, and we think of him fondly and toast him each time we open one of his labels. As is the norm in most of our dining experiences, our wine selection drove our dinner entree choices as we're firm believers in the overall dining experience being the matching of the food and wine. The synergies of properly paired wine with food amplifies the overall experience, the essence of the French who have made artwork of the craft. For a hearty dark earthy fruit filled wine I chose Angeli's wonderful Pasta and Peas with its ground Italian sausage, while Linda chose the Eggplant Parmigiana. Both were ideal complements to the wine. For starters we both had Angeli's spectacular Boston Clam Chowder, still the standard bearer for such a dish anywhere. For fun, we ordered an entree of Angeli's delicious Butternut Squash Gnocchi as carry-out to take home for our dessert afterwards. Back at home, we continued viewing the recently released season five of Longmire on Netflix. We've resisted binge-watching, but will finish the latest season episodes in one week of consecutive night viewing, none-the-less. With the gnocchi, I pulled from the cellar a 375 half bottle of Cavalchina dessert wine, a perfect accompaniment to the sweet dessert which Linda served with a dollop of chocolate mouse. The entree size portion served both of us several evenings of such savory enjoyment. Blend of Cabernet Sauvignon (92%, Cabernet Franc (6%) and Merlot (2%). Aromas of floral berry fruit permeated the room as soon as the cork was extracted from the bottle. Dark ruby colored, medium to full bodied, black fruits were accented by subtle tones of earth, creosote and graphite with hints of pepper and spice. At various points, a whisper of mocha emerged over the course of the evening. The finish was smooth and elegant with soft silky tannins. The emergence of the non-fruit layer might suggest the fruit is starting to give way as this seventeen year old vintage bottle starts to enter the later stage of life and end of its prime drinking window. We are about half way through a case of 24 half bottles we acquired of this wine for every day casual sipping, ideal for such occasions such as this evening. Upon release the color of this wine was straw, then turned to butter, and over time has consistently darkened to honey color and it is now the hue of weak tea. It seems to have gotten a bit sweeter and brighter with age suggesting that it might be at its apex here at a dozen years of age. Medium-full bodied, the apple fruits, subtle tangerine and hint of apricot and peach flavors have given way, overtaken by tones of burnt caramel, smoke and nut on a flavorful lingering finish.